This is a unique hand dyed silk scarf with silver threads complementing it running the length of the scarf. 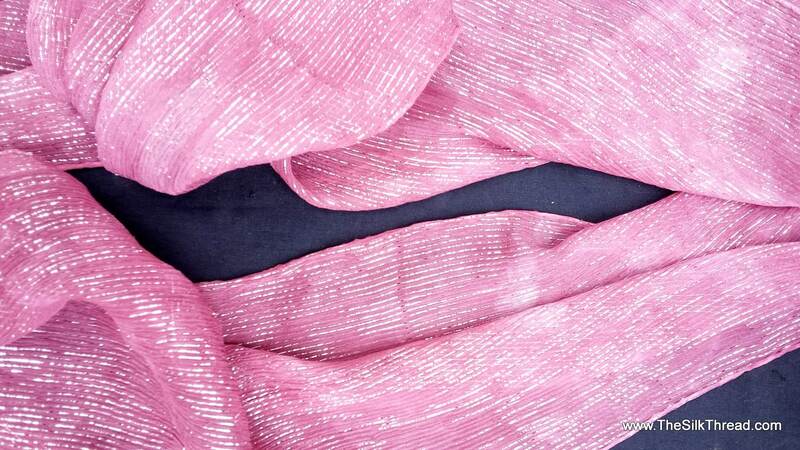 The hand dyed pink combined with the silver creates a beautiful shimmery scarf! A generous 10" x 60" size it would complement anything from casual to dressy. In all my silk pieces, I either design and carve my own reliefs, build the blocks and print my designs with textile inks to imprint the design onto the silk or hand draw all my designs onto the silk. The results are classic designs, beautiful colors and a one of a kind silk scarf. This is pure silk fabric with a lovely silver thread woven through its length. Each piece is hand painted and dyed by artist M Theresa Brown. Everything hand done here in my North Carolina studio.